Susan Hope Schaffer was diagnosed with breast cancer in 2004 when she was just 45 years old. She found her cancer through a self-exam, not from a mammography or ultrasound. She attributes her success in beating cancer to the excellent care she received by the healthcare providers of Fox Chase, to her family and friends for their love and unwavering support. In October of 2014, Susan was named the overall first-place winner in the Lilly Oncology on Canvas Art Competition. Her artwork titled “Visions of Hope captured part of her cancer journey. The narrative accompanying her artwork begins, “Cancer, a personal tsunami,” and goes on to describe how those around her played a role in giving her hope through her cancer journey: her doctors’ treatment outlines, her husband’s love, her mother’s strength, her daughters’ tears, her granddaughter’s eyes reflecting the future, and survivors’ eagerness to share their cancer journeys. The 2014 Lilly Oncology on Canvas competition awarded nearly $40,000 in prizes to cancer charities selected by the 17 winners in various categories. Artwork from the competition will tour cancer centers, hospitals and patient advocacy events nationwide beginning in January 2015. Over 600 submissions were judged. Susan donated her monetary award to Fox Chase Cancer Center and another Pennsylvania hospital where she had also been treated. Also, on September 18, 2014, Fox Chase hosted an event “Celebrating the Art of Survivorship” where the community from Fox Chase and supporters of the work they do came together to share the message of hope. Fox Chase Cancer Center was proud to partner with the American Association for Cancer Research, Lilly Oncology on Canvas and the National Coalition for Cancer Survivorship to create a mural representing survivorship. The mural was based on Susan’s artwork titled “Awakening” which won first place in the 2010 Lilly Oncology on Canvas oil painting category. On that day, she was thrilled to paint next to Doctor Neal Topham, the reconstructive surgeon who made her feel whole again. The mural was permanently installed at Fox Chase train Station located at 7931 Oxford Avenue, Philadelphia. Winning the mural competition in September was especially meaningful to her, as the month marked the 10th anniversary of Susan being cancer-free. Although she works in the legal field, she remains true to her first love which is art. 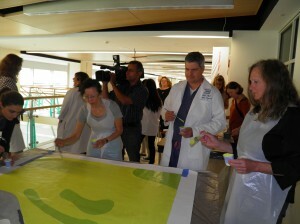 In September 2014, Susan’s artwork was made into a mural at Fox Chase Cancer Center’s annual celebration for cancer survivors.